Fourteenth, Fifteenth, and Sixteenth Centuries. District city in the government of Wilna, Russia. It was an important Jewish center in the fourteenth, fifteenth, and sixteenth centuries; and there is a tradition, quoted by Firkovich, that 330 out of the 483 Karaite families which Grand Duke Witold of Lithuania brought from the Crimea after his war with the Tatars, were settled in the new city of Troki, which was built expressly for them. The provisions of Witold's charter of 1388 to the Jews of Lithuania applied to those of Troki also. In describing Troki as it appeared in 1414 Gilbert de Lannua of Burgundy says: "In this city there live Germans, Lithuanians, Russians, and a great number of Jews, each of these peoples using its own language." Casimir IV. granted the Magdeburg Rights to the Karaites of Troki in 1441. The latter were to be subject to the jurisdiction of their own elder; and he in turn was to be responsible directly to the king or to judges appointed by the latter. Neither the way-wode nor the starost was to interfere in local matters concerning only the Karaites. Lawsuits between Karaites and Christians were to be decided by a tribunal composed of the Karaite elder and the waywode. These privileges were confirmed by Alexander Jagellon in 1492. Toward the end of the fifteenth century the autonomy of the Jewish community in Troki was still further strengthened by a royal order (1485) directing a separate levy and collection of taxes for its members. Individual Jews gained in influence through their growing commercial enterprises, as is shown by a series of contemporary documents. Thus in 1484 the customs duties of Novogrudok were leased to the Troki Jews Ilia Moiseyevich, Rubim Sakovich, Avram Danilovich, and Eska Shelemovich; in 1486 those of Jitomir, Putivl, Kiev, and Vyshegorod were leased to Simsa Kravchik, Sadka, Shamak Danilovich, and Rizhka, Jews of Kiev and Troki; and in 1489 those of Troki were leased to the Jew Mikhail Danilovich, of whom mention occurs in a document of 1495 also. At the beginning of the sixteenth century the prosperity of the Troki Jews had declined considerably, and they petitioned King Sigismund for relief. In response the king issued the following decree, dated July, 1507: "In view of the impoverished condition of the Jews of Troki, and desiring to help them to regain the prosperity which they enjoyed under King Casimir, King Sigismund confirms to them their ancient privileges." Suits between Jews were to be decided by the Jewish elder appointed by the waywode of Troki with the king's consent. Suits of Jews against "Lithuanians, Russians, and others" were placed under the jurisdiction of the waywode or his vicegerent. 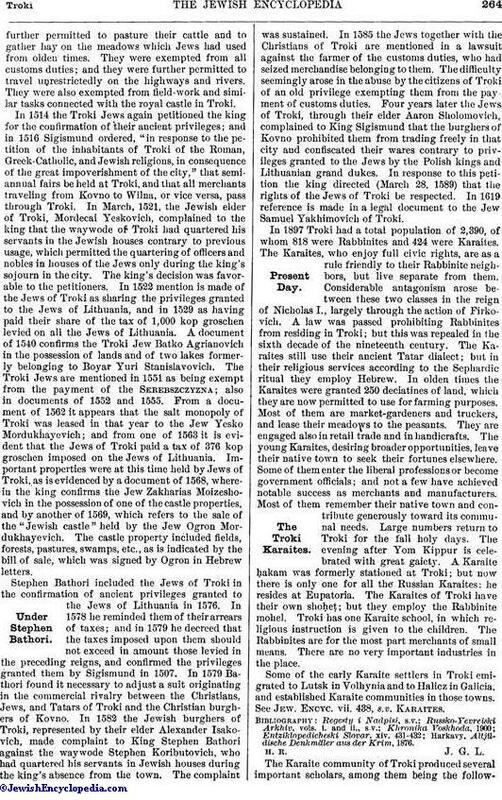 The Jews of Troki were to pay taxes once a year on equal terms with the other citizens; and no other taxes were to be levied upon them. In emergencies, following an ancient practise, they were to contribute according to their means, in common with the other citizens of Troki—Lithuanians, Russians, and Tatars—living in the Jewish portion of the town. They werefurther permitted to pasture their cattle and to gather hay on the meadows which Jews had used from olden times. They were exempted from all customs duties; and they were further permitted to travel unrestrictedly on the highways and rivers. They were also exempted from field-work and similar tasks connected with the royal castle in Troki. In 1514 the Troki Jews again petitioned the king for the confirmation of their ancient privileges; and in 1516 Sigismund ordered, "in response to the petition of the inhabitants of Troki of the Roman, Greek-Catholic, and Jewish religions, in consequence of the great impoverishment of the city," that semi-annual fairs be held at Troki, and that all merchants traveling from Kovno to Wilna, or vice versa, pass through Troki. In March, 1521, the Jewish elder of Troki, Mordecai Yeskovich, complained to the king that the waywode of Troki had quartered his servants in the Jewish houses contrary to previous usage, which permitted the quartering of officers and nobles in houses of the Jews only during the king's sojourn in the city. The king's decision was favorable to the petitioners. In 1522 mention is made of the Jews of Troki as sharing the privileges granted to the Jews of Lithuania, and in 1529 as having paid their share of the tax of 1,000 kop groschen levied on all the Jews of Lithuania. A document of 1540 confirms the Troki Jew Batko Agrianovich in the possession of lands and of two lakes formerly belonging to Boyar Yuri Stanislavovich. The Troki Jews are mentioned in 1551 as being exempt from the payment of the Serebszczyzna; also in documents of 1552 and 1555. From a document of 1562 it appears that the salt monopoly of Troki was leased in that year to the Jew Yesko Mordukhayevich; and from one of 1563 it is evident that the Jews of Troki paid a tax of 376 kop groschen imposed on the Jews of Lithuania. Important properties were at this time held by Jews of Troki, as is evidenced by a document of 1568, wherein the king confirms the Jew Zakharias Moizeshovich in the possession of one of the castle properties, and by another of 1569, which refers to the sale of the "Jewish castle" held by the Jew Ogron Mordukhayevich. The castle property included fields, forests, pastures, swamps, etc., as is indicated by the bill of sale, which was signed by Ogron in Hebrew letters. Stephen Bathori included the Jews of Troki in the confirmation of ancient privileges granted to the Jews of Lithuania in 1576. In 1578 he reminded them of their arrears of taxes; and in 1579 he decreed that the taxes imposed upon them should not exceed in amount those levied in the preceding reigns, and confirmed the privileges granted them by Sigismund in 1507. In 1579 Bathori found it necessary to adjust a suit originating in the commercial rivalry between the Christians, Jews, and Tatars of Troki and the Christian burghers of Kovno. In 1582 the Jewish burghers of Troki, represented by their elder Alexander Isakovich, made complaint to King Stephen Bathori against the waywode Stephen Koributovich, who had quartered his servants in Jewish houses during the king's absence from the town. The complaint was sustained. In 1585 the Jews together with the Christians of Troki are mentioned in a lawsuit against the farmer of the customs duties, who had seized merchandise belonging to them. The difficulty seemingly arose in the abuse by the citizens of Troki of an old privilege exempting them from the payment of customs duties. Four years later the Jews of Troki, through their elder Aaron Sholomovich, complained to King Sigismund that the burghers of Kovno prohibited them from trading freely in that city and confiscated their wares contrary to privileges granted to the Jews by the Polish kings and Lithuanian grand dukes. In response to this petition the king directed (March 28, 1589) that the rights of the Jews of Troki be respected. In 1619 reference is made in a legal document to the Jew Samuel Yakhimovich of Troki. 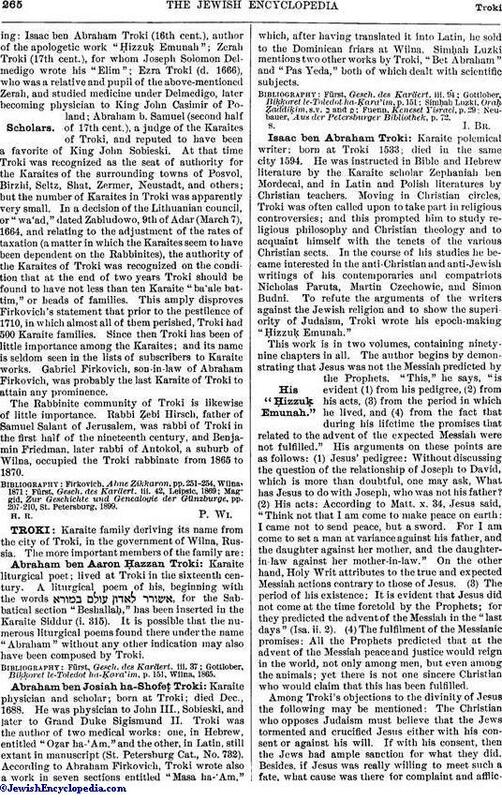 In 1897 Troki had a total population of 2,390, of whom 818 were Rabbinites and 424 were Karaites. The Karaites, who enjoy full civic rights, are as a rule friendly to their Rabbinite neighbors, but live separate from them. Considerable antagonism arose between these two classes in the reign of Nicholas I., largely through the action of Firkovich. 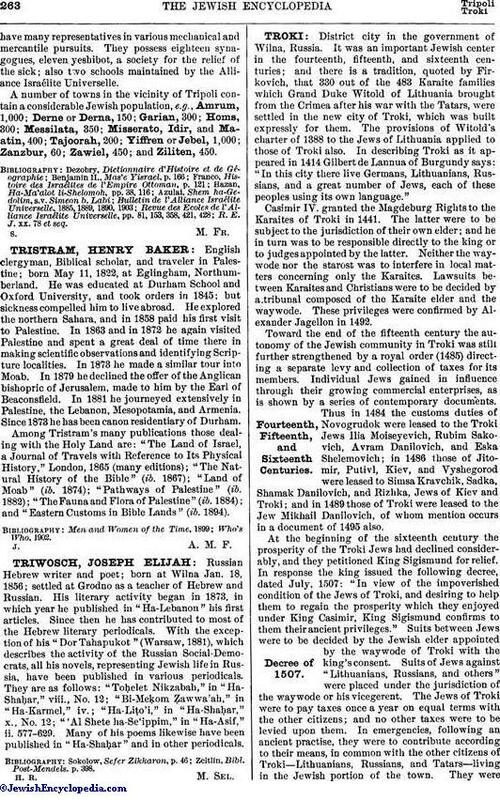 A law was passed prohibiting Rabbinites from residing in Troki; but this was repealed in the sixth decade of the nineteenth century. The Karaites still use their ancient Tatar dialect; but in their religious services according to the Sephardic ritual they employ Hebrew. In olden times the Karaites were granted 250 deciatines of land, which they are now permitted to use for farming purposes. Most of them are market-gardeners and truckers, and lease their meadows to the peasants. They are engaged also in retail trade and in handicrafts. The young Karaites, desiring broader opportunities, leave their native town to seek their fortunes elsewhere. Some of them enter the liberal professions or become government officials; and not a few have achieved notable success as merchants and manufacturers. Most of them remember their native town and contribute generously toward its communal needs. Large numbers return to Troki for the fall holy days. The evening after Yom Kippur is celebrated with great gaiety. A Karaite ḥakam was formerly stationed at Troki; but now there is only one for all the Russian Karaites: he resides at Eupatoria. The Karaites of Troki have their own shoḥeṭ; but they employ the Rabbinite mohel. Troki has one Karaite school, in which religious instruction is given to the children. The Rabbinites are for the most part merchants of small means. There are no very important industries in the place. Some of the early Karaite settlers in Troki emigrated to Lutsk in Volhynia and to Halicz in Galicia, and established Karaite communities in those towns. See Jew. Encyc. vii. 438, s.v. Karaites. Harkavy, Altjüdische Denkmäler aus der Krim, 1876. H. R. J. G. L.Scholars. The Karaite community of Troki produced several important scholars, among them being the following:Isaac ben Abraham Troki (16th cent. ), author of the apologetic work "Ḥizzuḳ Emunah"; Zerah Troki (17th cent. ), for whom Joseph Solomon Delmedigo wrote his "Elim"; Ezra Troki (d. 1666), who was a relative and pupil of the above-mentioned Zerah, and studied medicine under Delmedigo, later becoming physician to King John Casimir of Poland; Abraham b. Samuel (second half of 17th cent. ), a judge of the Karaites of Troki, and reputed to have been a favorite of King John Sobieski. At that time Troki was recognized as the seat of authority for the Karaites of the surrounding towns of Posvol, Birzhi, Seltz, Shat, Zermer, Neustadt, and others; but the number of Karaites in Troki was apparently very small. In a decision of the Lithuanian council, or "wa'ad," dated Zabludowo, 9th of Adar (March 7), 1664, and relating to the adjustment of the rates of taxation (a matter in which the Karaites seem to have been dependent on the Rabbinites), the authority of the Karaites of Troki was recognized on the condition that at the end of two years Troki should be found to have not less than ten Karaite "ba'ale battim," or heads of families. This amply (disproves Firkovich's statement that prior to the pestilence of 1710, in which almost all of them perished, Troki had 500 Karaite families. Since then Troki has been of little importance among the Karaites; and its name is seldom seen in the lists of subscribers to Karaite works. Gabriel Firkovich, son-in-law of Abraham Firkovich, was probably the last Karaite of Troki to attain any prominence. The Rabbinite community of Troki is likewise of little importance. Rabbi Ẓebi Hirsch, father of Samuel Salant of Jerusalem, was rabbi of Troki in the first half of the nineteenth century, and Benjamin Friedman, later rabbi of Antokol, a suburb of Wilna, occupied the Troki rabbinate from 1865 to 1870. Maggid, Zur Geschichte und Genealogie der Günzburge, pp. 207-210, St. Petersburg, 1899.